It has the partial look of an Old country pottery piece. Quickly done cheaply and quickly for almost purely local use. Or maybe somebody trying to produce that look? Its the decoration that looks odd tho. 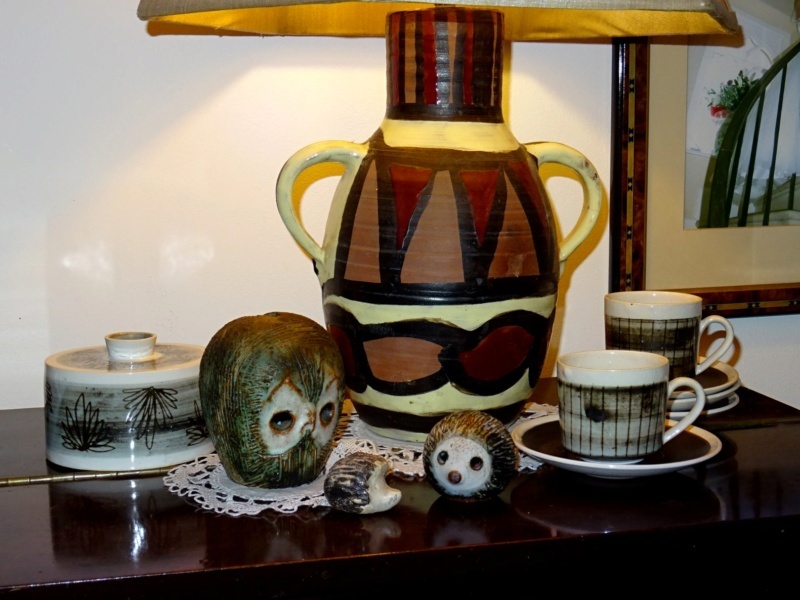 While the crudeness would probably go with a country pottery piece, the black and red decoration just does not fit. TY ..its deff not a simple id. I wouldn't disagree but another option is that the decoration could have been added many years later by a previous owner. TY for comments...I'll just report back that it's not one of the well known makers. Best to report back that we can’t tell based on just one photo. Base photo essential. And their location if they are outside the UK. There was a phase for lamp bases some time ago. You could pick up pottery for next to nothing drill a hole, and then let your design tastes loose on it. Seen some good pots ruined. David Frith, Mulcheney….., We might well call it vandalism nowadays! Not to keen on the lamp base but I do like the cups, very much!